Farmers farm for the love of farming. They love to watch and nurture the growth of plants. They love to live in the presence of animals. They love to work outdoors. They love the weather, maybe even when it is making them miserable. They love to live where they work and to work where they live. If the scale of their farming is small enough, they like to work in the company of their children and with the help of their children. They love the measure of independence that farm life can still provide. I have an idea that a lot of farmers have gone to a lot of trouble merely to be self-employed: to live at least a part of their lives without a boss. Me, too. I don’t have forty acres, or a mule — or even a vegetable patch and a couple of laying hens — but it’s interesting how closely my life parallels what Berry describes. I had to look up coastal Bermudagrass, I don’t think it grows this far north – I’m guessing there will be more & more interest in salt-tolerant plants. I recognize that flower, one of my grandmothers had those in her garden, or a cultivated variety of it – it’s great, kind of jazzy-looking. They just finished Empire Farm Days in Seneca Falls – – where the NY farmers get together every year, to drool over equipment, talk about beef, dairy, etc. This state’s ag production is nothing like Texas, of course, but you’d probably be surprised. I’m impressed by the adaptiveness of the family farms in my county – they’ve gotten into cheese production, craft brewing (and growing hops again), sheep, milk goats, pumpkins seeds, you name it. The flower goes by several names. One is firewheel, which suits it as well as blanket flower or Indian blanket, I think. It is a beauty, and will spread like crazy. In Galveston, they not only tolerate it, they encourage it, and it spreads through the neighborhoods and along the streets. It does jazz things up. One of my good friends was raised in upstate New York, on a dairy farm — Johnstown. Her family produced ice cream as well as milk. After her parents’ deaths, she continued to run the farm — quite a feat. I learned a lot about the New York dairy industry from her, and was reminded on a yearly basis why it is that I don’t move north, despite my love of snow. She lived in a big, old house, and keeping warm was a months-long project for her. I’ve always associated New York with apples and wine. I just looked at a map of the state to see where Seneca Falls is, and finally noticed why it’s called the finger lakes region. Where did you take the photograph? In Palacios, at the Texas State Marine Education Center. Despite its name, it also has a good bit of prairie acreage, and some nice trails, along with bay access. That’s the spot where I found the white basket-flowers a couple of years ago. After red and white, all you have to do is find blue there. Maybe next July 4th. I love those Blanket flowers. We have a big patch in the perennial border in the Royal Botanic Gardens in Melbourne, so I have several images of them in my archives. Farmers love growing their food and having control over what they eat, but many are now being forced to give up in the wake of continual droughts or flooding rains. My Mother’s family were all dairy & vegetable farmers, but my cousins have had to seek alternative employment with the poor income in the last 30-40 years. My brother’s hobby farm is highly productive but he lives too far away to enable me to benefit from freshly grown produce without harmful chemicals that he takes for granted. Given what you’ve shown us of the Botanic Gardens, I suspect their plantings of this flower are stunning. It’s one of my favorite flowers, and here, at least, it has the added advantage of a very long bloom time: months, rather than weeks. Thus it always has been for the farmers: at the mercy of flood and drought — and hail, and insects, and late freezes, and market fluctuations. Today, industrialized farming presents different challenges, and the scooping up of farmland by real estate speculators (sometimes called developers) is yet another issue. And then there was my great-uncle, who tempted Iowa farmers from their rich, midwestern land to Louisiana, with promises of ever greater crop yields. When their crops failed and they couldn’t make their payments, he’d repossess, and they’d go back to Iowa. He was what they call a crook, although the family was more delicate when describing him. I’m lucky to have a family farm nearby that allows picking in season. It does make a difference, as you know. The pic is beautiful. I don’t know if all that Berry said is true but maybe it is in a way. My parents were farmers because the work and knowledge was handed down through generations. My dad the youngest of six was the chosen one to remain and help my grandparents with their farm. All the old German families kids in my general area continued to farm. Now days that is no longer the case because you need money to begin farming and there are no banks that will loan money to someone who thinks they can farm. Many acres are required in order to make a decent living. The farmer is always dependent on whether the weather will cooperate and if not, everything is lost for that year and maybe even the next year. It’s odd but second cuttings are supposed to have a higher protein count. I have not researched this- it just something that I’ve always heard. I should look into that. time. My parents seemed to stay in a constant state of fear. I am surprised they lived into their eighties. I’m not sure it’s possible to take a bad photo of blanket flower, and I was delighted to find these tucked next to the hay bales. Back in 2011, I visited what’s called a Century Farm in Minnesota. They’re meant “to honor Minnesota families that have owned their farms for at least 100 years, [have farms that are] at least 50 acres in size and are currently involved in farming.” They have Sesquicentennial Farms for those who’ve been on their land for 150 years, too. Needless to say, those aren’t so common, for just the reasons you touched on. I have a postcard publicizing my great-grandfather’s farm sale. I don’t know the year, but I know where it was held, the date (March 3) and what was being sold: hogs, horses, and cattle; assorted farm equipment; and a thousand bushels of corn were included. If it had stayed in the family, I might have ended up a farm kid, but it didn’t, so I didn’t. The unpredictabilities involved in farming are real, and stressful. At my local farm this year, the fig trees were bearing the best crop they’d had in years — certainly more than a decade. Then, the rain came: inches and inches of it. In a few days, eighty percent of the figs were on the ground, the tomatoes were splitting, and the squash were squishy. Deep sighs all around, and then? Begin again. We had a farm of over 100 acres which with Australia’s unpredictable rainfall is not enough to eke a living from. Even though we weren’t far from the coast, rain agonisingly stopped short of dumping its waters on our region for very long periods. We had a flowering weed called Patterson’s curse. It was named so because it would quickly out crowd nutritious grasses and would colour entre hills with purple flowers. It was toxic, so therefore the weed inspectors would force farmers to spray it with herbicide. The above ‘love of farming’ is true for many, but it comes with many curses as well. Everything’s a mixed bag, don’t you think? The predictability of office routines can lead to boredom, and the regimentation that comes with bureacracies can lead to resentment. Trying to work in concert with nature can lead to frustration and occasional failure, but there are rewards that can’t be calculated in any of the usual ways. I knew you had experience with alpacas, which always tickled me, but I missed knowing about the cottage. I suspect that’s another occupation that brings some frustrations along with the rewards. The best-laid plants gang aft a-gley, if you will. I had the great good fortune to have a career where I could work from home, and so lived where I worked, had interesting work, did a job with a human service component, and was pretty much my own boss, so I can empathize with that desire in others. When you’re your own boss, you get your own way and can have things the way you want them. That, I suspect, is one of the key appeals of any such profession. Flexibility’s an advantage, too. You keep a different daily schedule than I do — of necessity, since varnishing in the dark’s not so easy. But being able to set hours, to begin early or work late, to work on weekends and take time off during the week, was so beneficial during those years that I was caring for Mom. Because I could take time off as necessary for doctors’ appointments and such, there was somewhat less stress. Of course, even as sole proprietors we don’t always get our own way. Weather’s the great controller for me. No matter what I’ve tentatively planned, it’s always the first hour of the morning that confirms or resets the schedule — and of course there’s no telling what will happen later in the day. Six pop-up rain showers in a day can cause havoc. 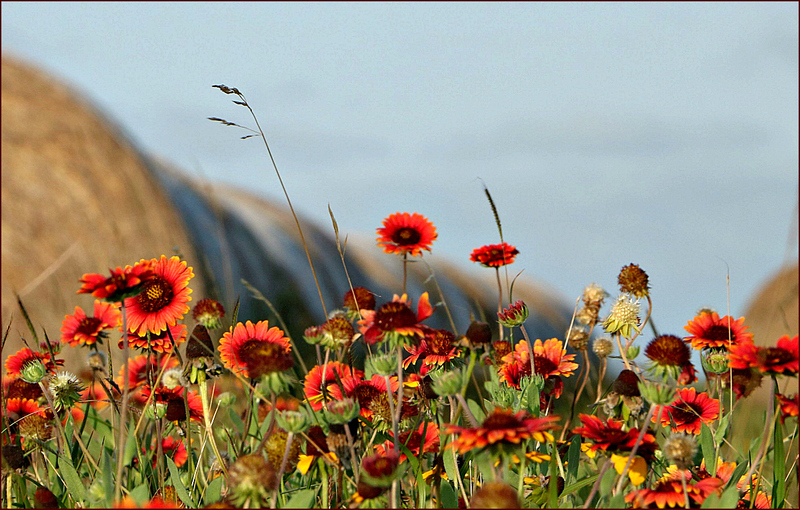 Flowers that combine colors as beautifully as the blanket flowers always are appealing. The range of colors is nice, too — and even on gray, cloudy days, they seem to shine. Have you ever knitted a piece in blanket-flower colors? It would be pretty, I think. I learned to drive in a hay field — no, it was alfalfa, but the bales were little bitty ones compared to what technology produces today! Bermuda-grass hay probably fetches a high premium, and August would be a good month for it to dry well before baling. The farmers probably would not want that hay to be ‘polluted’ by the gaillardia, but I would want to snip a few of those lovely stems and take them home for a happy nosegay by the kitchen sink! There still are rectangular bales around. The few horse owners I know use the smaller bales, while the large, round ones seem to be used more in cattle feeding. I have a vague impression that some things, like alfalfa, bale better in squares, but I don’t know that for certain. Of course, the equipment needed for those huge bales is more expensive, too — not only for baling, but also for carting them from field to storage, trucking them, and so on. A strong person can heave a single square bale, but you, me, and a dozen of our closest friends would have trouble moving one of those big round ones. I’m not surprised the flowers appeal to you. The colors in your avatar, and in much of your artwork, echoes theirs. 65 sounds like a very fair price.. but then, I’m not having to buy enough to stock a barn to last thru the winter months! I’m enjoying the comments and replies, Linda! We went to an antique tractor fair today – plenty of men in overalls and plaid shirts, little kids running around, bigger ones driving old tractors in the tractor parade, a very vintage baler or two parked in the field. In short: a photographer’s paradise. Events like that — county fairs, threshers’ reunions, rodeos, tractor shows — always make me happy. For one thing, the food’s usually pretty good, and there are a lot of smiling people. Not only that, some of those plaid-shirted, overalled men are running operations that would befuddle a lot of corporate upper management: the women, too. You don’t stay in farming if you’re incompetent or lazy! I have to tell you again how glad I am that you started this blog. Beautiful photos and perfect words. It’s my Sunday thing! You sound like me when I still was trying to work out of town from time to time. Every time I was “here” I needed to be “there,” or vice-versa, and it became extraordinarily frustrating. How far is the drive from home to the lake? I suspect it’s not the drive as much as the “shifting gears” that’s the issue. I’m glad you’re enjoying the blog. I certainly am. Now, I’m just wishing it would cool off a bit. I tried to make myself go out with the camera this weekend, but it didn’t happen. After a week in the heat, I was ready to take a break, and we were really and truly August hot — well over 100. It’s not abnormal, but that doesn’t mean it’s pleasant! What a truly lovely image, Linda! Thank you, Pete. I do love the brightness of these flowers, and I think this shows that agricultural settings can be just as pretty as the prairies or woods. Linda, I think most of us self-employed folks have gone to a lot of trouble — and expense! — to work without a boss hanging overhead! It’s not always easy. In fact, often it’s doggone hard. But there’s a lot of pleasure and satisfaction in not having to get gussied up and fight traffic to an office building for an 8- or 10-hour day, then do it all in reverse at closing time! I’m sure you’ve laughed, as I have, at the people who suggest that owning your own business means being able to take time off whenever you want, as well as chucking the high heels. To the contrary — those 40 hour weeks go out the window. Not having to commute in Houston traffic does have a lot going for it. Sometimes it can take me 20 or 25 minutes to get home, but that’s if I’ve timed things badly, or there’s been an accident on the bridge. When I have to spend an hour or more to go into Houston, I give thanks that it’s not part of a daily routine. Of course, I do get into it with the boss now and then, but we usually work things out. The committee meetings are quite something! I like the image of a kind of flower that can bloom, repeatedly, with just the right situation–like a well-placed trimming. Likewise, I imagine a farmer of any sort, enjoys the production of plants–with a little (or, more likely, a lot!) of well-placed and well-timed human effort. That surely is the gaillardia that you just described; I can’t think of a hardier wildflower, or a more prolific one. As for the farmers, think how many paintings over the years show a farmer or farm workers standing at the end of the day, looking over their fields — filled with weariness, perhaps, but pride, too. That’s right — the great outdoors isn’t just for farmers. Gardeners, habitat restorers, and just plain nature lovers — we all profit from it. And I’ve come to see this photo making another point: that different uses of land can coexist. Farming and agriculture don’t have to mean the destruction of everything in sight: although too often commercial farming means just that.